Calf raises are an extremely important exercises for strengthening the ankles and calves. Interestingly, few people actually do calf raises and even fewer know how to do them correctly. So, first, let me just tell why they are so important. The feet are what come into contact with the ground and they are directed by the ligaments and muscles in the ankles and calves. If the calves are tight and weak (like most people), your overall movement and speed will be inhibited. This can lead to decreased athletic performance and cause knee, hip and low back pain. It can also dramatically increase the risk of a sprained ankle, the #1 sports related injury. Ideally, you want your ankles to be strong and stable with a healthy range of motion. And you want your calves to be strong as well. This will improve sports performance (sometimes this can be significant) and lower the risk of injury, including ankle sprains. Including calf raises in your workout routine is simple and only takes 2-3 minutes, but the benefits are huge. A great exercise for achieving this is known as the calf raise. There are so many different ways you can do calf raises and many of them are excellent. I will take you through the most basic method here as I have found it to be extremely simple and effective. In the beginning, you can do this without a step, but you should advance yourself to a step when the exercise is no longer challenging on the ground. 1. First and foremost, make sure your feet are straight. There will be a position for your feet that feels comfortable and this is almost always with your toes pointing slightly out. This is because most people have very tight calves and walk like penguins. You can begin to correct this by doing a quality calf stretch. To clarify what I mean by your feet being straight, look at the outside part of your foot. That should be in a straight line. In reality, it will force your foot to feel awkward and like it’s pointing inward. That’s the correct position. Don’t worry, it will get a lot easier over time. 2. Now, push from the inside part of the ball of your foot. Again, most people push from the outside of their feet and this is NOT correct. You will only be working the outside of the calves, which are probably too strong already and right now we are working the center of the calf. 3. Push up as high as you can on the inside part of the ball of your foot and hold it for 2-3 seconds. Really push through the ground with the balls of your feet, bringing your heels as high as they will go. 4. Now, let your heels come back to the ground. If you are using a step, let your heels hang off the step for 3-5 seconds and get a really nice stretch. Remember, most people’s calves are weak and tight, so stretching here will really help. Do about 8-12 calf raises with your feet in this position. Now, most people, even if they do calf raises correctly, stop here. But, all you did was work the center of your calf. We also want to work the inside and outsides of the calves too. Remember, the body moves in 3 dimensions and if you only work the center of your calf, the inside and and outside of your calf will become weaker, which could increase your risk of injury. 5. So, get your feet into a position where they are pigeon toed. In other words, force your toes inward and your heels outward. From here, do 8-12 calf raises in this position the same way as described above. Most people find this is the hardest foot position, because this is where their calves are the weakest (on the inside). 6. Finally, point your toes outward and do 8-12 calf raises again. Most people find this is, by far, the easiest position, because this is where the calves are the strongest. The reason for that, as I mentioned above, is that most people walk like penguins, with their toes pointed outward. As a result, the outside of their calves may be strong, while the center and inner calf are weak. If you find this is the case with you, you may even want to skip pointing your toes outward and just focus on the first two positions for a while. I cannot emphasize the importance of this simple exercise enough. It is one of the foundations for strong ankles and calves which are what propel your movement. The stronger and more stable they get, the faster you will become. 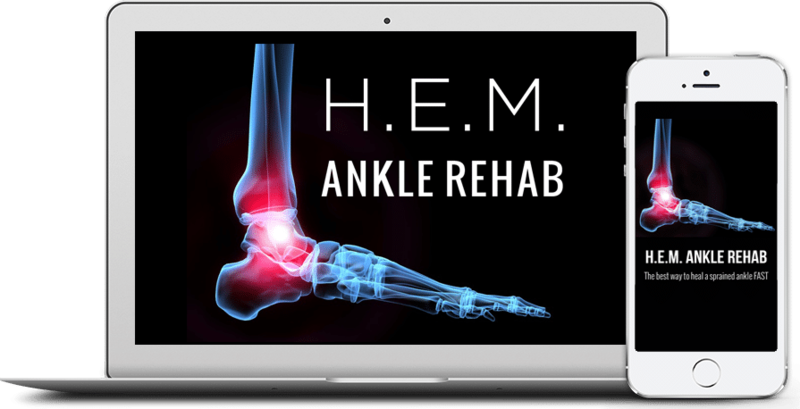 And the best part, you will be reducing your risk of ankle sprains which can set back any athlete for a long time. So, I hope you will start incorporating this exercise into your regimen in order to get some really great benefits.